Youth sports evaluations are changing – for the better. Athlete evaluation software is emerging as a must-have technology for youth sports organizations of all sizes as they need to run more efficiently and provide better service to players and parents. Staff and volunteers can run tryouts with a small fraction of the effort involved with the traditional paper and spreadsheet process, while also getting results to players and parents days sooner, reducing errors, increasing transparency and improving communication. Player evaluation software is also used by many organizations for in-season and end of season player evaluations, coaches feedback, and evaluating players at camps and combines throughout the year. The many uses and benefits make it a must-have tool for organizations wishing to improve their operations, and the youth sports experience in general. In this guide, you’ll learn the ins and outs of athlete evaluation software and why so many organizations are ditching the paper and spreadsheets for a better way. In a hurry? Email yourself a copy of this player evaluation software guide to read later! For decades, running youth sports tryouts and coach evaluations involved evaluators, paper and pencils. Score sheets were provided to evaluators and grades were entered for each player. This got the job done. But now the evaluation game is changing – for the better. As statistics, player history, evaluations, and real-time results are becoming more in-demand for youth sports, evaluation software has emerged. Here are tips on how to prepare your evaluators for tryouts! This solution provides the same capabilities the old way of scoring with paper and pencils did, only it’s instantaneous, more organized and more accurate. Evaluation software includes protections from biases. Player feedback reports can be sent to players immediately after tryouts, and throughout the season to create transparency between the organization and the player. And coaches and directors can access the player results in real-time to make roster formation a breeze. The short answer is probably yes. If you have experienced any of the issues listed below or can answer yes to the following questions, then player evaluation software might be right for your club. Do you have difficulty managing tryout registrations and player check-ins? Do you find errors in score/evaluation sheets? Do you struggle to convince parents and players that tryouts are fair? Do you make miscalculations compiling and averaging scores? Do you spend too much time forming rosters? Do you lack ways to create transparency and share results? Do you have difficulty managing mid/end of season coaches evaluations? One of the biggest pain points during player evaluations is registration. Even the most organized club can run into issues with lost registration forms, no-shows, late registrations, and tardy arrivals. This can cause confusion for the staff at the registration table, as well as the evaluators who have to account for additional players. Evaluation software makes those situations non-issues. Players can easily be checked in through the app, creating a quick process. No-shows can be removed, late arrivals and new registrants can be quickly added and assigned to groups. Most youth sports clubs use multiple evaluators during tryouts. While this is great for keeping evaluations on schedule, it introduces room for error for clubs who use manual evaluations. An evaluator can accidentally enter a score under the wrong player or record the wrong grade. They might use the wrong scoring scale to evaluate the players. These are all simple and realistic mistakes that wouldn’t be caught (if they are noticed at all) with paper forms until the numbers are tallied and the rosters are being formed. Sports evaluation software gives coaches, directors and other assigned administrators real-time access to player scores. This gives personnel ample time to notice the mistake and get it corrected. Teams can also enter the scoring scale into the system, preventing evaluators from using the wrong methodology. Running fair tryouts is something all clubs strive for, but unfortunately can’t always be guaranteed. Evaluators might show favoritism towards one athlete over another for various reasons. There are safeguards teams can put into place when using evaluation software. The application allows teams to list athletes by only their registration number and not their name. This prevents an evaluator from knowing which player they are grading, ensuring scores are based on performance, not name. Having real-time access to the scores and rankings also allows coaches and directors to monitor player scores. Personnel can investigate if an athlete’s scores look suspicious or if outliers exist which may indicate bias. When sorting through stacks of paper evaluation forms and manually calculating scores, there are likely to be mistakes. Handwritten scores and comments can be very difficult to read. If someone makes a typo, adds the wrong scores together, or their handwriting is illegible there can be significant errors in athletes’ overall score sheets. Player evaluation software takes the risk out of this process. The application automatically tallies each player’s score and comments, removing the chance for human error. Forming rosters can be a time-consuming process when using paper forms and spreadsheets. Players need to be manually ranked based on scores, and only one person can make edits at a time. Drafts and team formations can be prolonged while coaches and directors wait for rankings to be updated and shared. A lot of busy-work needs to take place before an organization can even begin discussing players and their results. This process is much quicker when using player evaluation software. Player scores and rankings are automatically available in the platform. Multiple people can view the information in the app simultaneously, making the roster formation process fast and easy. Read about how the St. Croix Soccer Club saved 20-30 hours of work by using player evaluation software during tryouts! When players are scored manually, there is room for players and parents to question roster placements and cuts. Evaluation software helps eliminate these questions by adding more transparency. Player evaluation reports can be sent directly to each player and their parents after the conclusion of tryouts. This allows each athlete and their family to see the exact scores team administrators used to determine rosters. Check out this Guest Post from the Positive Coaching Alliance on how to positively make player cuts! Bonus: Download a copy of this guide and get the Sample Parent Communication Template as well! Trying to get coaches to complete mid- and end-of-season player evaluations on spreadsheets can be a painful process. It’s common for clubs to email evaluation forms to coaches and have very few completed evaluations returned. This leaves players without feedback on their season and what to improve on over the offseason. It also means next year’s coaches and directors won’t have an evaluation to refer to when the athletes try out the following season. Even when coaches do complete evaluations, often they are not completed in a professional format that can be shared with parents and players. Evaluation software makes this process much more successful, and easier. Organizations can create a survey-like evaluation form and send the link to coaches to complete. The simpler form for coaches enables a much higher return rate. It also allows all evaluations to be completed in a uniform, professional template, making them easy to email to parents and players. Convinced player evaluation software is right for you? Find out how the TeamGenius platform can take your club to the next level with improved efficiency and accuracy. Contact us! 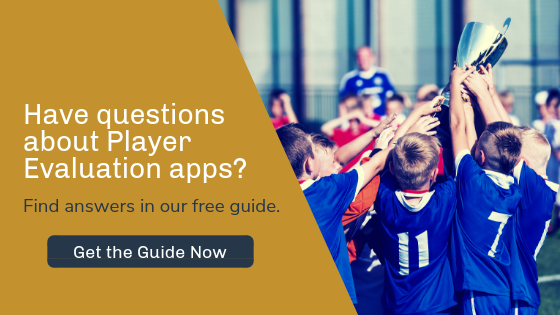 Once a youth sports organization determines it needs player evaluation software, the next question becomes which one to use. Clubs need to find a software solution that fits their needs and goals. When selecting player evaluation software, organizations should consider many aspects including flexibility, cost, and expertise. Take a look below at areas clubs should evaluate to ensure the team is choosing the right company and platform. Flexibility: Can the software be customized to fit your needs? Most organizations have been running player evaluations and forming teams for years. If the club has a method that works, it shouldn’t have to change it. Instead, find a software that works with the team’s current methodology and enhances it through improved speed, efficiency, and accuracy. Even if a team doesn’t have a specific method it’s using, it should ensure the software allows for customizations so the organization can set up the platform to fit its needs. Ease of Use: Is the software intuitive? Evaluation software needs to be easy to use. The right software will save organizations time and be more intuitive than paper methods. If clubs are spending more time trying to learn the program and training their staff on it, then it’s not doing its job. Teams should find a software system that they are comfortable using and are confident others can learn quickly. Data Security and Reliability: Is the data secure and stored in a credible place? Who owns the data? When entering information on youth athletes, it’s important for organizations to find software that keeps their data secure and stores it in a credible space. Clubs should also ask who owns the data if it’s sold to other third-parties, and how the team can access it. It’s also critical that you can count on the product being available when you need it. Ask where the software is hosted and what measures have been taken to ensure app availability. Innovation and Market Leadership: Is the software provider reputable with a proven track record? When selecting evaluation software, clubs should go with the best. Organizations should invest in a platform that is leading the industry in technology and capabilities, and that was developed by a company that understands its clients’ needs first-hand. By backing the market leader, you can rest assured knowing that you’re working with a company who will continue to invest in bringing you more value. Organizations should do research on the company before purchasing the software and make sure it is a proven leader in evaluation software. Integrations: Can the software integrate with other programs and applications for ease of use? When searching for the right evaluation software, clubs should make sure the solution works with other programs, applications and integrations that they are already using. Required Equipment & Hardware: What is needed to run the software? Before teams purchase evaluation software, they should ask upfront what equipment or hardware will be needed to run the platform. The evaluation app needs to work on any device and both iOS and Android platforms. Also, ask about on/offline capabilities and about the company’s recommended internet access solutions. Multiple Purposes Beyond Tryouts: Does the software have a purpose beyond tryouts? Organizations should look at the whole picture of what they need before selecting an evaluation software. They should think beyond tryouts and team formation and consider the future state of the club. Does the organization need a faster and easier way to perform coach and player evaluations? Does the team need the ability to send communications to players and parents? Does the club need an easier way to store player feedback? Is the organization interested in tracking ongoing player growth and development? All of these requests can be fulfilled with the right software. Budget: Is the pricing clear and simple? Every organization operates on a budget. Before committing to an evaluation software solution, clubs should know exactly what costs they will incur, and what’s included with the price. There shouldn’t be hidden fees or surprise costs that will show up later. Player evaluation software providers should give organizations a clear and simple price. Typically pricing differences come down to the value you’re going to get – you get what you pay for when it comes to the quality of the software. If a price seems too good to be true, it probably is and is often an indicator of a struggling business and one to be avoided. Here are 10 Easy Steps to Creating Youth Sports Club Budget! Training, Support, and Customer Success: What support is available post-purchase? When selecting an evaluation software solution, organizations should check into how much training and ongoing support is provided. Will someone be available to help the organization set up their account and prepare for evaluations? Do they provide training videos, articles, and other resources? Does the club have a lifeline during tryouts, even on weekends, if help is needed? Does the company have a track record of soliciting and responding to customer feedback? Organizations should review training and support options for any evaluation software it’s considering. Reviews, Testimonials, Partnerships and Reference Customers: What are others saying about the company and the software? Organizations should research a company’s client list, read reviews on Capterra, review testimonials and/or case studies on their website and review a list of their current customers and partners before deciding on which evaluation software to select. Do they already work with clubs known and trusted by the organization? Do they have partnerships with major governing bodies or multi-region/national clubs? Are online reviews positive? These are all great indicators of the quality of a player evaluation platform, and equally as important, the company and people behind the platform. Make sure to consider these questions carefully when choosing the right player evaluation software for your organization. Most player evaluation software providers charge a per player fee of between $3 and $5 per athlete per year. Although this is a reasonable cost for most organizations who find the value and return on investment clear with player evaluation software, this cost still requires the organization to budget and identify a source of those funds. Here are the three most common sources of funding for player evaluation software. The most common way to fund evaluation software is to increase tryout or season registration fees. Keeping costs manageable for families is very important, but when presented with the value of more accurate, transparent and faster results, and even the ability to receive feedback during the season, parents are often happy to pay another $5-$10 per season. Lack of feedback and transparency during tryouts is one of the most common parent complaints, and two of the major benefits of player evaluation software. Clubs can host camps, showcases or clinics throughout the year for players to develop their skills. For most organizations who currently host these types of events, simply adding in an evaluation component and feedback report at the end dramatically increases the value to both the player and their parents. This is an easy way to cover the costs of evaluation software, and can even be a source of revenue for many organizations who make a significant profit from these events and can now justify a higher price. Local and even national sponsors are constantly seeking opportunities to get their brand and message in front of youth sports families and player evaluations present the perfect opportunity for them to do so. Consider putting a small package together for an evaluation sponsorship. This could include signage or a table at the tryouts, where parents often hang around to observe part of the event. Additionally, many organizations choose to send batch emails to parents with tryout results and with coaches feedback during the season. Why not include a sponsor mention and logo within these emails? Due to the nature of the information, you can be certain that a large percentage of the recipients will open and read the entire email, making it a unique and valuable sponsorship opportunity. You’re convinced that player evaluation software can help your club or association tremendously, but aren’t sure what’s involved in getting set up and running digital evaluations. Like anything new, setting up evaluation software does require an initial investment of time, but the payoff is big. As we mentioned previously, time savings, increased transparency and accuracy, and the speed of forming rosters or sharing player feedback during the season are some of the many benefits and again, well worth it. Here are the three high-level phases of implementing player evaluation software. Most organizations can expect to spend a total of 2-4 hours implementing evaluation software. Before your event, you’ll want to ensure you’re set up and confident in the digital evaluation process. This usually includes an initial training session with an onboarding coach who will help you set up your account and scoring criteria, upload your players and run through the logistics like player check-in and number assignment using the software. You’ll also want to make sure that you’ve communicated with those evaluating players at the event. Look for quick start guides or videos to share with evaluators ahead of the event so they can familiarize themselves with the mobile scoring app and process. Some organizations also find that notifying parents that they’ll be using evaluation software brings greater transparency and trust. Depending on the type of evaluation event you’ll be managing, you may need to manage player check-in and number assignment, take player profile pictures and handle walk-ups as your event begins. A complete digital evaluation solution will make these tasks intuitive and fast. Coaches will need to have downloaded the mobile app for the evaluation software, or they can use a browser-based scoring app where they’ll be collecting scores and notes on players. All of this data will be automatically compiled and available in the administrative backend in real-time. No more manual data entry to spreadsheets! If your evaluation event isn’t a tryout, camp, or showcase, the steps are even easier. You’ll simply email a link to your coaches where they can evaluate their team on their computer, phone or tablet from the comfort of their home or office. Easy. With digital evaluations, you’ll have real-time scores and player rankings, so you can begin using the results and making decisions immediately. Most evaluation software offer a number of results views where you can sort and filter, see ranges and averages, and overall player rankings. These can be used right away to form teams, send personalized offer letters, or share feedback with players after the event and throughout the season. There is no doubt that implementing evaluation software takes an initial investment of time, but by choosing a provider with a complete evaluation software solution that has an intuitive design and user experience, and professional training staff, you can be confident that the implementation process will go smoothly. The dozens of hours you’ll save each year, along with all of the other benefits we covered, will easily be worth it. It’s a common problem. Some staff or volunteers know the organization needs player evaluation software, but they have to convince the board of directors (or others holding the checkbook) it’s worth the investment. How can a club demonstrate the return on investment of evaluation software? The ROI can be shown in the following ways below, including time savings, increase in value and improved customer loyalty. An organization’s staff and volunteers’ time are valuable. They shouldn’t waste it through inefficient processes during tryouts. Youth sports evaluation software can provide time savings for both volunteers and staff members throughout tryouts and the team formation process. Evaluation software allows organizations to erase the headaches caused during player check-in at tryouts. Players can easily be checked in through the software upon arrival, and immediately assigned a number and a group. Even late arrivals can be checked in hassle-free, and their information can be automatically added to the players’ list, easing the pain of having to alert evaluators and update scoring sheets last-minute. Evaluation software also saves volunteers and staff time entering and calculating player scores. When teams use paper evaluation forms, scores are entered by hand and all scores are manually tallied. This introduces the risk for error in calculations. It also means individual results can’t be seen by other administrators until the scores are shared at the end of the tryouts session. Using evaluation software makes this process easier and quicker, as was experienced by a Midwest soccer club. The St. Croix Soccer Club of Western Wisconsin and the Eastern Twin Cities simplified its player ranking system when it transitioned to TeamGenius’ evaluation software. The club was able to enter player scores into the system and allow administrators to see the player rankings and scores in real-time. St. Croix Soccer Club Coaching Director Nathan Klonecki estimated the software saved his club 20 to 30 hours of work during tryouts alone. It’s not uncommon to have questions about technology when it comes to transitioning from paper and pen to digital evaluations. We’ve compiled a list of the recommended devices and internet access solutions for smooth digital evaluations. Cellular Data – if no wifi is available, and purchasing a mobile hotspot is not an option, administrators and evaluators can use their own personal cellular services. Gym, Arena, or Field Wifi Network – Make sure to test ahead of time to ensure a solid connection. If the network is slow, it may be worth the investment in a hotspot. Many organizations like having control of their own reliable and mobile internet connection for many situations, not just tryouts. Wifi Hotspot – Look for one with long battery life and that can support many devices connected at once (ideally 10+). Pay a little extra for a high-speed data plan to make sure you don’t get bogged down in the middle of your evaluation. A good evaluation software platform will have apps available for both Android and iOS devices to ensure it works for every coach or evaluator. Some even have browser apps which can be accessed from a laptop or desktop computer and printable paper forms as an alternative for the less tech-savvy evaluators. It’s usually not necessary to purchase new devices for evaluations – at most organizations, coaches and staff use their personal devices – which they typically prefer anyway. However, if you’re interested in purchasing new devices for the organization, iPads are great, and if on a budget, there are many good Android choices. We don’t recommend purchasing cheap devices, however. Many of the $75-$150 range devices are meant for playing kids games and their low computing power won’t provide the reliability and performance you’re going to want at a live evaluation event. It’s always a good idea to have a charging solution or battery backups available. If outlets are readily available you should be all set – just have evaluators charge their devices between sessions. External battery packs are a great idea though, as they will charge your device without being plugged into an outlet, allowing the evaluator to remain mobile. Modern devices are incredibly durable and even moderate rain shouldn’t hurt them. Paper forms, in contrast, get wet and ink or pencil smears leading to data loss and a failed evaluation event. If rain is expected, get umbrellas or tents for evaluators and instruct them to score on a mobile phone as they can hold an umbrella in one hand and score with the other. Yet another advantage over paper and clipboard. What if the internet access drops or wifi doesn’t work? Most evaluation tools have an offline capability where data saves locally to the device. If internet is unavailable the evaluators will be able to continue scoring offline and sync their scores later once re-connected. Some evaluation software providers allow you to print paper back-ups, which will give you peace of mind and is also a good option for evaluators who prefer not to evaluate on a device. Still have more questions? We have answers. In addition to the technical hardware FAQs, we’ve compiled a list of the most frequently asked questions when it comes to player evaluation software. Have a question that you don’t see below? Let us know! How much time will a player evaluation app save my organization? Although needs vary significantly by organization, most organizations who switch to digital evaluations report saving between 30 and 40 hours during tryouts alone. Though in many cases, the time savings reported is much more significant than that, and most organizations utilize software for camps, clinics, coaches, evaluations, referee evaluations and more making time savings over a year much greater. Is player evaluation software just for tryouts? Evaluation software has many use cases beyond tryouts. Evaluate your needs and choose the tool that best suits them. Some solutions are specifically for player feedback or combines and don’t support the youth sports tryout process well. Chances are a tryouts solution is your biggest need, but you’ll get a much bigger bang for your buck if the solution you choose also supports player feedback, coaches evaluations, and camp capabilities as well. We already have a tryouts process, do I need to change it to use evaluation software? This depends on the evaluation software provider you choose. Some are designed to be entirely customizable to support your existing process – scoring criteria and ranges, weighting of skills, multi-day tryouts, and customizable player fields. Others lock you into their templates and you may need to adjust your process in order to use the tool. Make sure to ask this question while reviewing evaluation software platforms to make sure you choose the best one for you. How much does evaluation software cost? Athlete evaluation software prices typically fall between $3 and $5 per player per year, although some can get as high as $15 per player for those designed for collegiate and professional programs. Do evaluation software providers offer training and support, or am I on my own? This varies greatly by provider. Some offer onboarding sessions included in the price, while others provide only video tutorials and a support line if you need help. Assess your needs and how much help you would like. It may be worth paying a little more per player to get the piece of mind of knowing you have all the help you need – even on weekends. How much time and effort will it take to implement evaluation software? As with any change, an initial investment of time is required to learn the new system and process. Depending on the ease of use and design of the tool, most people can get set up and ready for evaluations in 2 to 4 hours. This time may include an onboarding session with a trainer, customizing your assessment, uploading players, and testing out the check-in process. We know how important the tryout and team formation process is in the development of your son or daughter as an athlete, and in ensuring they have as much fun as possible. This year, we invested in an evaluation software tool called TeamGenius to help us improve the evaluation process. TeamGenius allows our evaluators to enter scores through a mobile app rather than on paper. Their scores are immediately compiled with other evaluators scores on the TeamGenius website, which is only accessible by our club administrators who we have specifically granted access. This dramatically reduces the chances for error as we will not need to collect sheets of paper and transfer handwritten scores and comments from paper to spreadsheet. Additionally, the high-quality data and analytics within TeamGenius will help us to confidently place your son or daughter on the appropriate team, and to notify you of their team placement much sooner after tryouts. This tool also allows us to easily collect coaches evaluations during the season. We plan to share a player feedback report from your son or daughter’s coach at the end of the season. We’re confident this tool will help us create a better experience for everyone this year. Please let us know if you have questions or concerns. Athlete evaluation software is helping youth sports organizations raise the bar for tryouts and coaches evaluations with the efficiency, accuracy, and transparency it provides clubs. Gone are the days of clipboards and manual data entry into spreadsheets. Evaluation software is the present and future of youth sports. By eliminating the risks of human error in grading systems and calculations, and making results and rankings available in real-time, evaluation software improves player evaluations of all kinds for the organization and its players. The application will pay for itself in the amount of time it saves youth clubs in administration tasks, compiling scores and forming teams. It will also help clubs advance their standing throughout the community and league with the backing of parents and players for its anti-bias capabilities and improved communications. Is the evaluation software right for your organization? If your club wants to save time, improve accuracy and fairness, and share ongoing player development feedback with athletes and parents, then it could be a great investment. Now that you know all about player evaluation software, are you interested in learning more about TeamGenius? TeamGenius is a powerful yet simple player evaluation tool serving thousands of youth athletes, coaches, staff and volunteers across all major sports.